How Chris Hemsworth snuck his daughter onto a ride at Disneyland. It seems Chris Hemsworth will do just about anything to give his daughter what she wants. Appearing on Jimmy Kimmel Live! 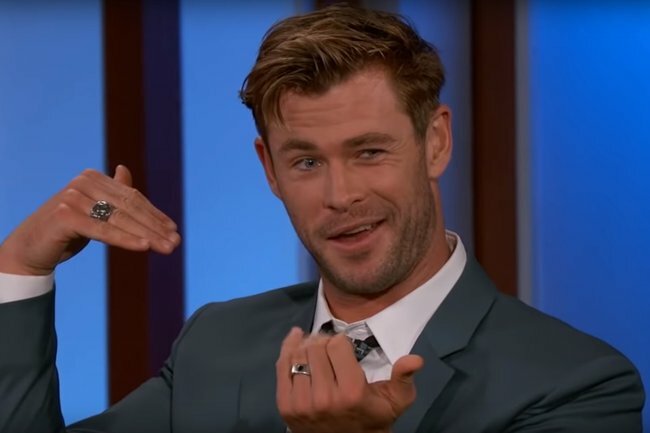 earlier this week alongside the cast of Avengers: Endgame, the actor shared a sneaky parenting hack he used to get his now-six-year-old daughter on a height-restricted Disneyland ride. While visiting the park with his wife Elsa Pataky and his three children in 2017, Hemsworth’s daughter India Rose was drawn to a ride called the Tower of Terror. “I took my daughter [on the ride] a couple of years ago when it was previously called the Tower of Terror or something,” the 35-year-old told late night show host Jimmy Kimmel. But after realising India was too short for the ride’s height requirement, Hemsworth came up with a plan to get his daughter onto the ride. “She was really upset. And I was like nah, forget this,” he said. “I grabbed a couple of Snickers bars and slammed it in the back of her shoe under the heel. I walked up [to the Disneyland staff] and was like ‘What about now?&apos;” he continued. “It’s wildly irresponsible,” Hemsworth’s Avengers: Endgame co-star Scarlett Johansson jokingly added. But after getting on the tower attraction – where riders are lifted 54 metres into the air before being dropped at high speed – the father-of-three realised he had made a big mistake. “We’re sitting in the chair and we’re at the top and I’m looking at her and she’s strapped in and the seat is massive on her,” Hemsworth said. According to the actor, India began to rise in her seat when the tower dropped. On Twitter, some fans criticised the actor for sneaking his daughter onto the ride. Wait did Chris Hemsworth just admit he put snicker bars in his daughters shoes so she can meet the height requirement for tower and terror and she was slipping out of her seat during the ride??????? As Chris eventually realised, height restrictions at theme parks are in place for a reason – so please don’t try his hack next time you go to the theme park. What do you think about Chris Hemsworth’s “irresponsible” parenting hack? Let us know in the comments section.